Tutorials - AIMWEB Global Web Solutions - Leaders in Search Engine Optimization, Pay Per Click Management and Search Engine Marketing. Cape Town, South Africa. Search Engine Optimization (SEO) is the process of improving the visibility of a website in a search engine �natural� or �up-paid� results. In general, the higher pages (pages that appear higher on the search results) attract more visitors and customers from the search engine users. As an internet marketing strategy, SEO considers how search engines work, what people search for, search terms and combinations of keywords typed into the Google search box. In a nutshell, optimizing a website involves editing its contents to increase the number of keywords and their relevance, increasing the number of links (also called �backlinks� or �inbound links�) as well as associating social media, articles etc. with the specific website and its contents. It has been statistically shown that as many as 72% of all search engine users will skip the �paid� advertising search results and will go directly to the �natural� or �up-paid� search results to look for the product or service that they are searching for. The process of getting a website to be dispalyed in the �natural� or �up-paid� section of the search engine results is knows as �SEO� or �Search Engine Optimization� and involves a number of aspects that differ from industry to industry and from company to company. Now that you know what SEO (Search Engine Optimization) is we suggest that you read our other articles that explain the benefits of doing SEO as well as the steps that are involved in running a successful SEO campaign for your website. Above article is copyright of AIMWEB and cannot be copied or distributed without the written permission of the website owner. AIMWEB is a leading industry expert in Search Engine Optimization and Search Engine Marketing. Please give us a call on 021 557 1595 should you wish to find out more information regarding the above articel and the SEO packages offered by AIMWEB. Now, if your website as the guesthouse owner is not on the first page of my search results, your chances of me staying at your guesthouse have just dropped by 50% and if you are not on the second page of my search results it will drop by further 40%. Why? 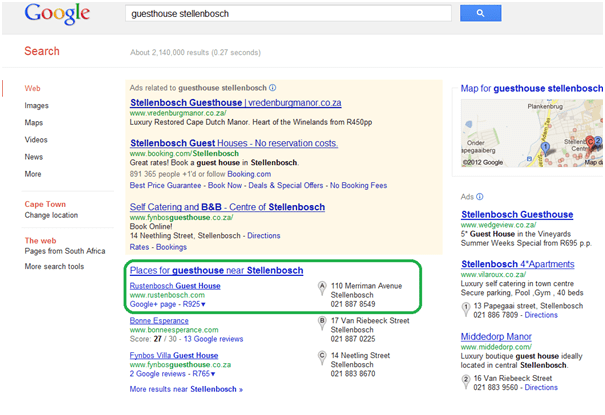 That is because I do not know what your guesthouse is called and therefore I choose a combination of keywords (in my case �Guesthouse Stellenbosch�) in order to find ANY guesthouse that will meet my requirements and as soon as I have found something that fits with my expectations and my budget I will not looks through any more search results. The above keyword combination �Guesthouse Stellenbosch� is one of numerous keyword combinations that the potential customers of your guesthouse may be looking for. Such keywords may be �Bed and Breakfast Stellenbosch� or �Accomodation Stellenbosch�. 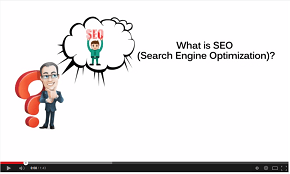 A successful online marketing SEO campaign can bring �targeted� customers to your business. These customers are targeted because of the specific keywords and keyword combinations that we cater for. In the next section called �Doing SEO keyword research� we will address the topic of how to go about picking the winning keywords in order to get the most traffic to your website, which will result in more customers and more sales. The most important thing before taking a journey into a successful SEO campaign is to place yourself in the shoes of your potential customers and to �understand� what it is that your potential customer is most likely to be searching for when they are looking for the products and/or services that you are offering, but know nothing of your business and its name. Write down a list of keywords and keyword combinations. Try to focus on two�to�four keyword combinations in order to �narrow down� the search. For example, if you are a used�car dealership, you might be inclined to target the word �car�. However that would be a bad idea due to the fact that people that actually search for the word car might be looking to buy a new car or�maybe to repair their car. A much�better�keyword combination would be to use�for example �buy used cars�online� as this will bring a much more targeted client based�which will be targeting the �niche� that your business is�in. There are a few tools available to you that can assist you with understanding what�your potential customers are searching for when looking for the services that you offer.�The most popular tool in Google Ad-Words. Although this tool is targeted primarily at the �pay-per-click� advertising model, the keyword tool available from Google Ad-Words is free and will be able to assist you in getting the right set of keywords to target. 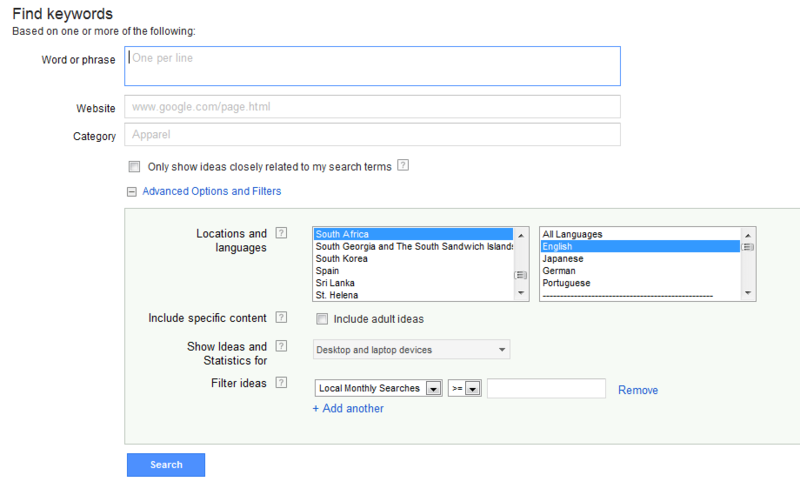 The Google Ad-Words keyword tool is located under the �Tools and Analyses� section in the Google-Ad Words main interface. Here you will need to type in one or more of the keyword combinations of your choice, expand the �Advanced Options and Filters� menu and select �Locations and languages� as well specify �Exact� keyword search on the left hand side of the screen. Also, you may find it very useful to add the �Trends� column that will show you the local trend statistics from month to month. Google Keyword Tool will give you a good indication of the total monthly search and therefore of the total monthly views that you can expect by targeting a certain keyword combination. Once you have the set of keywords and keyword combination that you are going to optimize for you are ready to start with the search engine optimization of your�website. It is a good idea to document the list of keyword together with the average number of monthly search as well as the local trends (if these are applicable to your business) on an excel spreadsheet as these will come in useful when you are optimizing your website. Above article is copyright of�AIMWEB�and cannot be copied or distributed without the written permission of the website owner. AIMWEB is a leading industry expert in Search Engine Optimization. Please give us a call on 021 557 1595 should you wish to find out more information regarding the above article and the SEO packages offered by�AIMWEB. A website can be viewed as a CV for a business. The website can either make a positive or a negative lasting impression on a potential customer, just like a CV could on a possible employer. No matter how much you pay for your online advertising or how high of a ranking you manage to achieve for your website, if your website looks bad you will scare away potential customers. For a potential customer your website is the face of your business and your chance to make a first impression. With that being said, the look and feel of your website has little influence of the Search Engine Optimization process as a whole. However, the importance of the content on your website cannot be over emphasised. The content of your website needs to be directly in-line with the keywords and keyword combinations that you chose to optimize for. Without a structured content on your website your website will fail to achieve high page ratings and be on the first page of the search engines �natural� or �organic� search results. Aligning your keywords with your page content is not an easy task and sometimes requires a complete overhaul of your website�s design. Aligning your keywords to your page content however will lead to great return on investment when performing SEO of your web page. Above article is copyright of AIMWEB�and cannot be copied or distributed without the written permission of the website owner. Before we begin discussing the advantages and the disadvantages of both �natural� search engine results and the �pay-per-click� search engine results, let first re-cap the difference between the two. �Natural� or�also called �organic��search engine results are the results. Search engine optimization (SEO) is the process of affecting the visibility of a website or a web page in a search engine�s �natural� or un-paid (�organic�) search results. [jargon] In general, the earlier (or higher ranked on the search results page), and more frequently a site appears in the search results list, the more visitors it will receive from the search engine�s users. Studies indicate that people are less likely to click on paid search ads rather than on results from organic search engine optimization. For example, one study found that search users are up to six times more likely to click on the first few organic results than they are to choose any of the paid results, while an eye-tracking study showed that 50% of users begin their search by scanning the top organic results. Other studies have shown that only 30% of search engine users click on paid listings, leaving an overwhelming 70% who are clicking the organic listings. And a 2003 study found that 85% of searchers report clicking on paid links in less than 40% of all of their searches, and 78% of all respondents claim that they found the information they we searching for through sponsored links just 40% of the time. Studies are beginning to indicate that the trust level for organic results is much higher than that of paid results, and that paid results are looked upon as a nuisance by some searchers. One study found that only 14% of searchers trust paid listings, and 29% report being �annoyed� by them. Another study found that 66% of customers distrust paid ads. Clearly, it�s not generally a good idea to upset potential customers before they even click on your link. Organic search engine results tend to be seen as non-biased, and they therefore are able to provide visitors that are more valuable. The overall conversion rate, or the rate at which searchers take a desired action on a site, is 17% higher for unpaid search results than the rate for paid (4.2% vs. 3.6%). Trends also have shown that more of the sales that result from search engines originated in organic search listings. 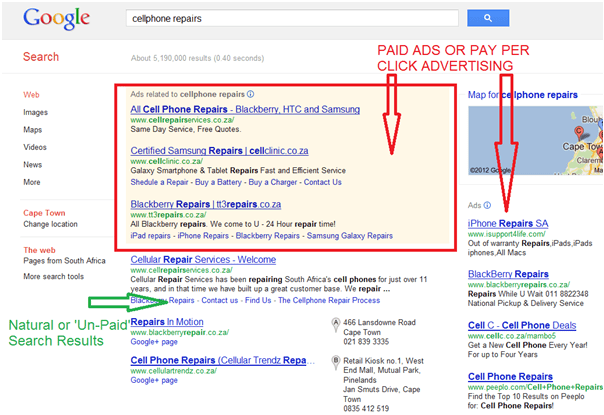 Visitors becoming more aware of pay-per-click as advertising. As more and more people turn to the Internet for research and information, more searchers are becoming aware of paid results as a marketing tool. One study showed that not only are 38% of searchers aware of the distinction between paid and unpaid results, 54% are aware of the distinction on Google, which is widely recognized as the most popular search engine. Meanwhile, pay-per-click costs are rising steadily. Between October 2004 and December 2005, average keyword prices rose from around $25 to just under $55.10 And the cost of keywords can increase by as much as 100% during the holiday season. These costs aren�t going unnoticed either; one study of problems experienced by US companies found that 57% of respondents felt that their desired keywords were �too expensive,� while 51% expressed concern that they are overpaying for certain keywords. On the other hand, when you outsource to an organic search engine optimization firm, your costs will likely remain more stable than the prices for pay-per-click advertising. While a pay-per-click campaign may produce results more quickly than an organic search engine optimization campaign, organic search engine optimization campaigns can give you results that last. When the budget runs out for a pay-per-click campaign, or when your company decides that the pay-per-click campaign should be terminated, the results end as well. With organic search engine optimization, the optimized site content and other changes made to your site can have an impact on your search results until the next change in a search engine�s algorithm, or possibly even beyond. Users also have rated organic search engine results as more relevant than paid results. On Google, 72.3% felt that organic results were more relevant, while only 27.7% rated paid results as more relevant. Yahoo offered similar results, with 60% calling organic results relevant compared to 39.2% for paid. Above article is copyright of�AIMWEB and cannot be copied or distributed without the written permission of the website owner. Keywords and Content�� this is by far the most important aspect of search engine optimization. In order for Google to give a website a high ranking that website needs to provide value of information for the customer. Backlinks�� this is a link to a website from another website. Number of backlinks is used by search engines as one of the most important factors for determining websites search engine ranking, popularity and importance. Social Media�� is defined as interactive platform. In our case most widely used social media includes websites such as Facebook, Twitter, Linked In, YouTube etc. Article Base�� articles are a very important when you want to increase a websites popularity as this is viewed by the search engine as �quality content�. 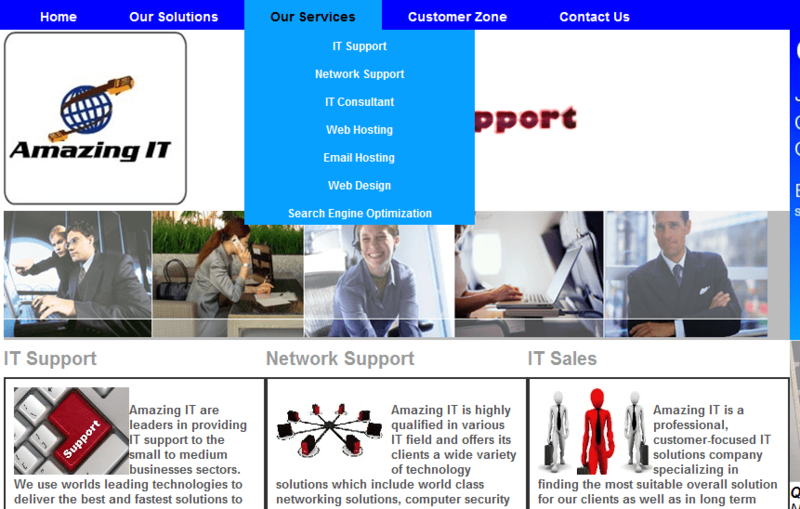 It tells the search engine that this website has quality information that it shares with its clients. AIMWEB is a leading industry expert in Search Engine Optimization and Search Engine Marketing. Please give us a call on 021 557 1595 should you wish to find out more information regarding the above article and the SEO packages offered by AIMWEB. There are two sides to running a successful SEO (Search Engine Optimization) campaign. These include the �on-site� factors and the �off-site� factors. The �on-site� factors include aspects such as the optimization of�webpage �Title�, webpage �Headers�, webpage �Meta Tags�, webpage �Content�, checking of the website for �Dead Links�, checking of the website for �Coding Errors� etc. In this article we will address the importance of page title and headers and how to get the most of these when doing SEO for your website. First of all, it is a good idea to understand which page of your website addresses which topic and to centre the content of that webpage around that specific topic. The most powerful SEO tactic is to page one page around only one keyword combination. For instance if your keyword combination is �IT Support� make sure that the webpage you are optimizing is centred around that particular keyword and uses it�repeatedly�in the content. Make use of the keyword you are optimizing for in the page title, if possible, begin the page title with that keyword, if not make sure that you do place that keyword somewhere in the title. Keep the description header tag short and to the point. As a general rule you do not want to use more than 156 characters in your website�s description tag. Again, you will need to ensure that you use the keyword that you are optimizing for in your websites description tag. If possible use the keyword up to 3 times in the description tag of your website. First of all lets discuss what META tags are. Meta tags are parts of an HTML (or code) document that are used for you to describe the page content for search engines. Meta tags are placed within the head area of an HTML file and with the exception of the Title tag your visitors do not see them as part of the visible area of the page. Meta Tags are highly abused and there is even a debate in the market that Meta tags are ignored by the search engines altogether. We don�t agree that this is true. First of all, we need to define Meta Tags for each of the pages in your website. To do this we need to understand what topic describes each page the best.